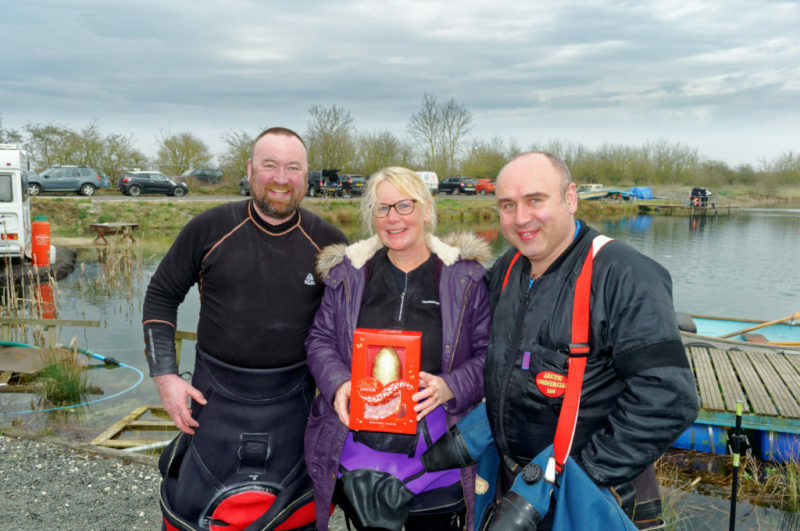 Greetings Divers – following last year’s successful event, the 2019 BSAC Great Yorkshire _Underwater_ Easter Egg Hunt will be repeated on Saturday 27th April at Eight Acre Lake. Please spread the word! All BSAC clubs, family and friends are welcome – *** please bring along your club banners *** and we’ll try and get a multi-club publicity shot for SCUBA magazine and BSAC HQ. * We’ll then divide into teams/pairs – devise a nickname for your buddy pair or team!! * Head off into the Lake to search for the ‘Eggs’! It is not a race!! Max dive time is 45 mins. Penalty points apply for exceeding the plan. * Please remember to check out with the same Dive Marshall!!! The ‘hunt’ is basically a bit of fun. A number of objects in the Lake will be tagged with laminated cards containing a number and colour-word. You have to correctly record the object name, colour-word and number e.g. HELICOPTER RED-27. The object names are those described on the bearings map supplied by Scuba Dream. Note that some objects are ‘undocumented’, so describe those as best you can!!! Each tag is worth 5 points. There will also be 3 Golden ‘Eggs’ worth 10-points each. These may be attached to the same objects as the colour-cards – remember to look carefully! PLEASE DO NOT REMOVE ANY TAGS!!! It would be helpful if more experienced divers could put themselves forward for dive leading less experienced divers from other clubs. There’ll be a few winners on the day – all in the name of fun. Judges decision, whilst pointless, is final! This is open to all BSAC divers. No commitment or deposit necessary. The only fee will be entrance to the Lake. Thank you to Mike Mudryk and team at Scuba Dream<www.scubadream.co.uk/eight-acre-lake-43-w.asp> for kindly supporting this event. Thank you to Pontefract BSAC who will be on-site fundraising, selling hot-dogs and onions to the hungry!